Departure Points: Normandy or Paris. Customize this. Your Normandy tour guide provides private transportation starting in Paris or you can take the train to and from Normandy. Normandy tour guides are available from Paris or Normandy. 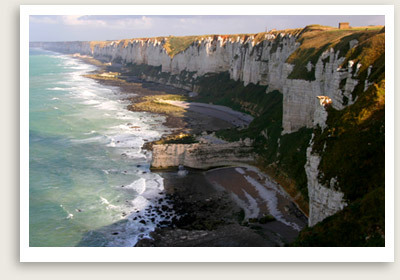 Private Normandy Tour Inclusions: Licensed, local tour guide, private transportation, taxes, tolls, parking. Assistance on train ticket purchase, if needed. Your private Normandy tour guide will take you to the seaside resort Cabourg. You’ll be enchanted by Cabourg’s long sandy beach lined with striped umbrellas evoking the “Belle Epoque”. Author Marcel Proust was a frequent guest in the town’s Grand Hotel when it opened in the early 1900s. You’ll have a brief tour of the city center here. Next your private Normandy tour guide will take you on a brief ride in the hilly countryside, dotted with horses, cows and apple trees, to reach Beuvron-en-Auge, a truly “picture perfect” village. Beuvron’s villagers take pride in keeping up their architectural heritage: multi-colored, half-timbered homes with window flower boxes. Your Normandy tour guide will take you to visit the 16th century Vieux Manoir in the village’s oval shaped square, and perhaps to stop for a glass of locally made calvados (apple brandy) while you’re here. Your Normandy tour guide then takes you to the twin seaside resort towns of Deauville and Trouville. Your Normandy tour guide will explore with you in Deauville and Trouville, separated by the River Touques and connected by a short pedestrian bridge. Trouville has been a favorite resort of artists and intellectuals since the reign of Louis-Philippe in the 1800s, its charms painted into perpetuity by painters like Eugène Boudin. You may stop to see Trouville’s old fishing harbor, still in use today. Finally you will cross the bridge to Deauville with your Normandy tour guide. This town was built up after Trouville, as aristocrats such as the Duc of Mornay, Napoleon III’s half brother, began constructing their villas on the other side of the river. The town today is still a favored haunt of movie stars and royalty, who flock to the town’s beach and its upscale shops and casino. You will have a final stroll on Deauville’s boardwalk, Promenade des Planches — an elegant seafront boardwalk lined with bars, cabanas, hotels, and half-timber Norman-style villas. Not exactly what you had in mind with your private Normandy tour guide? Inquire about a private and personalized tour with your Normandy tour guide. Include your desired Normandy tour destinations and activities.